An open letter to my colleagues in the School of Informatics. 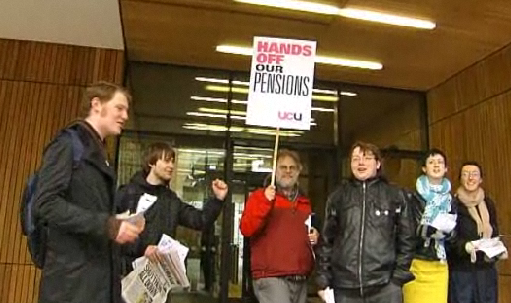 UCU strike to preserve our pensions on Thursday 24 March. remaining lifetime of the pension. a cut of 0.7% over twenty years compounds to a 13% reduction. the lifetime of a new hire's pension. picket line last Thusday, I saw more students than lecturers. extend to allowing me to retire with a decent pension. Why not save the money yourself rather using pyramid-scheme pension system? ^ why not investigate what pensions actually are before you say stupid things? It's his money that's he's been paying in and he wants to get it out. Demonstrate to me how pensions are a pyramid scheme. You can't because they aren't not similar at all. Very sorry to learn that things are so tough for universities in the UK. First students were attacked, now staff. Where will it end? Actually, most pension systems require constant population growth and additional tax payers to function. ie. It takes 2 taxpayers for every pensioner - thus necessitating a doubling of population. Money paid into pension schemes is not stored in most Western governments. It's spent - it's the next generation's money that is used to pay for them. Note, however, that there is a difference between a stable and an unstable pyramid scheme. That's where most arguments tend to focus. Feel free to keep quoting Glenn Beck, it isn't going to change the facts. or be prepared to chant on the streets. why o why do people think it is good to give government their money.. haven't they learnt it? why were they silent when the government was spending their money away by printing money like crazy and pouring it down into bottomless wells? This strike should have happened then. It is far far too late now. A few commenters have missed the point that USS (the pension scheme in question) is a fully funded pension scheme, unlike pensions for civil servants. Employees and employers pay in money each year, which the fund invests. The fund is in the black, and took in more money this year than it paid out. As people live longer, adjustments are required to keep the fund viable. UCU (the universtity staff union) has proposed modest changes that do the trick. The changes being pushed through by EPF (the employer's organisation) are mainly about saving money for employers, not keeping the fund in the black. Now﻿ this was a fight for civil rights, equality, workers' rights, and fair treatment, not sweetheart deals, ridiculous entitlements, and gravy train benefits. Some of the things union members call "rights" now would likely bring tears to Dr. King's eyes.